On 22 November, 2018, the UCLG World Secretariat and UCLG Africa hosted a Session dedicated to the Localization of the Sustainable Development Goals in Africa (SOU 4). This session was held in the framework of the 8th Summit of Africities, which took place in Marrakech, from 20 to 24 November 2018. This thematic session put the spotlights on a wide range of experiences and strategies that African local and regional governments have adopted to promote SDG implementation and integration at the local and regional levels. The session was chaired by the Mayor of Nguelemendouka, Jean Marie Nguele, who presented the progress made in Cameroon towards the achievement of the SDGs at local and regional levels. The first part of the session was dedicated to the presentation of the first progress of the GOLD V Report on Africa: Towards the Localization of the SDGs. Liza Cirolia, African Centre for Cities, set out the main findings of the African chapter, stressing the urgency to improve institutional frameworks, technical and financial capacities so that all levels of government are able to pro-actively contribute in a coherent way. She also highlighted the need to better acknowledge partnerships at the local level, including residents’ committees, to support the localization of the SDGs. Pierre Armand Beouinde, Mayor of Ouagadougou, and President of Burkina Faso’s Municipalities Association (AMBF), on behalf of the International Association of Francophone Mayors (AIMF), Youssouf Diakité, Executif Director of the Association of Municipalities of Mail (AMM) and Stanislas Hounkanlin, from the Association of Municipalities of Benin (ANCB) presented their experiences to support SDG implementation and integration at local level. During the debate, some mayors stressed the need to make the language of the SDGs more accessible and that the local authorities are developing many initiatives that contribute to the SDGs from long time ago as part of the daily work. The second panel discussion was the opportunity to discuss on the initiatives in awareness-raising, learning, training and capacity-building for SDG localization. Innocent Uwimana, President of RALGA, and Tshepiso Solly Msimanga, Mayor of Tshwane, who respectively represented the Common Wealth Local Government Forum (CLGF) and ICLEI, highlighted the actions they develop to localize the global agendas and the need to provide African local governments with adequate capacities to implement the SDGs. Caroline Odandi of the Council of Governors of Kenya (CoK), highlighted that the collaboration between the national government and the county governments is crucial to support the alignment of regional development plans with the SDGs in Kenya. 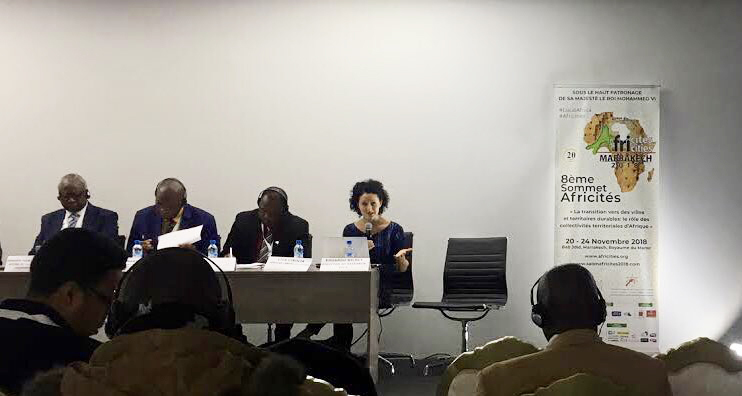 Najat Zarrouk, Director of the African Academy of Local Governments of UCLGA, showcased the learning initiatives developed by UCLG Africa in collaboration with various partners, such as UCLG’s Learning department. To conclude Lamine Abbad, from UCLG closed the session with the presentation of the main initiatives of World Secretariat on learning –particularly on training of trainers- and on reporting on behalf of local and regional governments to the United Nations, emphasizing that partnerships are critical to support African local and regional governments in the SDG localization process. Altogether, the contributions of the session will provide valuable information for the forthcoming GOLD V Report, whose conclusions will be submitted to the next Executive Bureau before its publication in 2019. Read GOLD IV: Co-creating the urban future.